Covering 18,000 square metres and located in a tranquil natural setting remote from the nearby housing estates and the bustle of their streets, the temple is, apart from being an important religious centre, a scenic attraction full of beautifully ornamented traditional buildings. Wong Tai Sin Temple is named after Wong Chu-ping ( 黄初平 huáng chū píng), who was born around AD 328. When Wong Chu-ping was 15, he began to follow Taoism. Forty years later, he achieved enlightenment and became immortal. People called him Wong Tai Sin from then on. It is said that he punishes evils, heals the wounded, and rescues the dying. The influence of Wong Tai Sin spread from Guangdong Province to Hong Kong in the early 20th century. With his mercy and his power, he is said to grant whatever is requested. In 1915, a Taoist priest, Liang Ren-an (梁仁庵 liáng rén ān), brought a sacred portrait of Wong Tai Sin from Guangdong in Southern China to Hong Kong. It was only fitting therefore that this magnificent temple be built and dedicated to this honored divinity revered down the ages for his benevolence. In perpetuation of such an unselfish philosophy, the temple preaches three traditional religions - Taoism, Buddhism and Confucianism. Wong Tai Sin Temple is known for its fortune-telling. The fortune sticks (or lots) in Wong Tai Sin Temple are very accurate. Many people who visit the temple come to have their fortunes told. Generally, worshippers entreat the fate of the same year. They light worship sticks, kneel before the main altar, make a wish, and shake a bamboo cylinder containing fortune sticks until one falls out. The stick is exchanged for a piece of paper bearing the same number, and the soothsayer then interprets the fortune on the paper for the worshipper. Wong Tai Sin has many worshippers in Hong Kong, so the joss sticks and candles burn exuberantly all year round, especially during the Chinese Lunar New Year and Wong Tai Sin's birthday - the 23rd day of the eighth lunar month. Annually, from January 1 to 15, the temple receives numerous visitors, such as those whose prayers were answered returning to thank the immortal. Wong Tai Sin's birthday on the 23rd day of the 8th lunar month, and the Chinese New Year holidays are the busiest times for the temple. On the Chinese New Year's Eve, thousands of worshippers wait outside the temple before midnight and rush in to the main altar to offer Wong Tai Sin their glowing incense sticks when the year comes. As the tradition goes, the earlier they offer the incense, the better luck they will have that year. The architecture is the traditional Chinese temple style with grand red pillars, a magnificent golden roof adorned with blue friezes, yellow latticework, and multi-colored carvings. Aside from the Daxiong-baodian ( 大雄宝殿 dà xióng bǎo diàn) , the Three-Saint Hall （三圣堂 sān shèng tang）and the Good Wish Garden ( 从心苑 cóng xīn yuàn) are also worth seeing. The temple grounds also feature three memorial archways. The first one stands outside the temple and is carved with the name of the temple. If you walk past the soothsayers and the fortune-telling stalls, you can see another memorial archway. And if you continue further along the third memorial archway standing before you. Memorial archways are a common feature of traditional Chinese architecture. 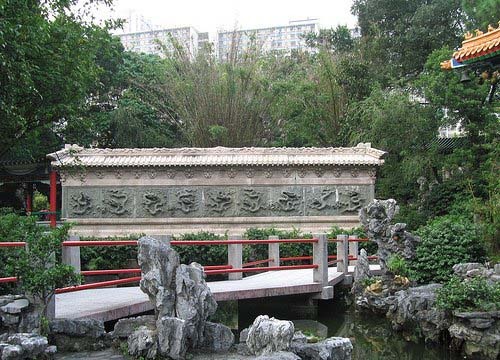 Also at the temple are the Nine Dragon Wall - a replica of the renowned Nine Dragon Wall in Beijing, and the Good Wish Garden - a miniature copy of Beijing's Summer Palace .The Three-Saint Hall is dedicated to Lü Dongbin, Guan Yin, and Lord Guan. Containing a portrait of Confucius, the Taoist temple has a collection of Confucian, Taoist, and Buddhist literature.Additionally, Wong Tai Sin Temple is the only temple that offers facilities for wedding ceremonies in Hong Kong. The temple is only about a kilometer and a half away from Kowloon Walled City Park. That is where a large crowded complex of flats used to be. There is now a park there where people can learn a little about the history of that interesting place in Hong Kong’s history.